At the beginning of the evening, only 13 men had ever won the elusive Sandow. At the end of the night, it was still only 13. Phil Heath did it again! The 50th Mr. Olympia competition kicked off Friday night with a stellar and contentious prejudging that featured great showings by Dexter Jackson, Shawn Rhoden, and Dennis Wolf—not just the two competitors who produced the most sparks at Thursday's press conference. 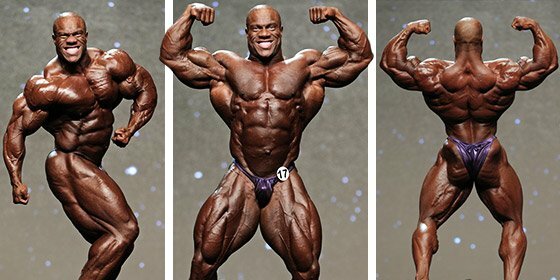 There were whispers that maybe one of these three could do what no one in this decade has done since Jay Cutler in 2011: squeeze in between Phil Heath and Kai Greene. But in the end, this was a two-man contest between two competitors who no longer need last names in bodybuilding debates. They're just Phil and Kai, and at the end of the evening, they stood alone. Phil Heath was very tight and brought great aesthetics as always, but for some reason his abs seemed less defined and almost bloated in some poses. He was very good, but not at his best ever. That said, I thought the competition was very close, and—as with the 212—would likely come down to the final posedown. I had Heath with a razor-thin edge heading into finals, and that ended up being enough. Kai Greene brought his best conditioning to date, pushing Phil Heath to the absolute edge. I would argue that Greene was actually the leanest competitor onstage, outshining even Heath in this regard. The fans seemed to agree, as he ran away with the Fan's Choice Award by a large margin. This was as great an opportunity as Greene has had, but Heath ended up holding the 50th Sandow. Next year will once again be fascinating to watch. Last year's drop to 4th place wasn't the sign of a decline. 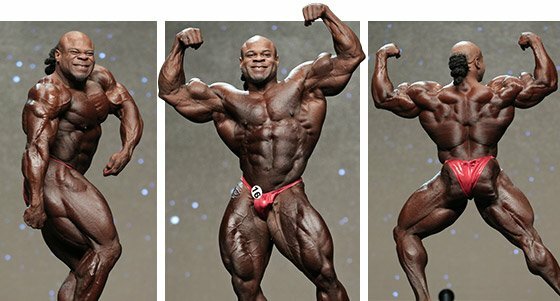 If anything, "Flexatron" was more impressive than ever at age 39 in his 4th Olympia. Bigger, fuller, and more defined than any previous version we've seen on this stage or any other, Rhoden certainly brought his best. His best just wasn't quite enough with Phil and Kai on point. A fascinating rivalry is blossoming between Wolf and Shawn Rhoden. They've gone back and forth in recent years in both the Olympia and the Arnold Classic, with each man figuring out how to gain an edge on the other from competition to competition. Wolf was as huge and defined as ever, and you could see his mixed feelings in his face as he walked up to accept the 4th-place check. The ageless Jackson continues to amaze—or is it even surprising anymore?—with his peerless conditioning and world-class symmetry. 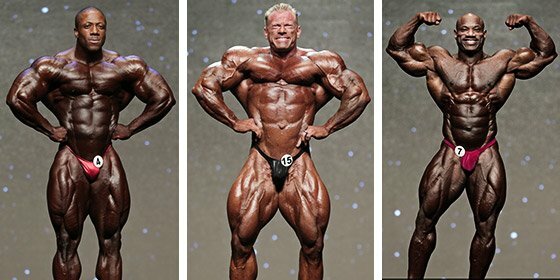 This was his 15th appearance on the Olympia stage, having won the competition in 2008, and he hasn't been outside of the top six since 2001. Let that sink in for a second. He cemented his place as one of the all-time greats of this competition long ago, regardless of how many Sandows he has in his trophy case. Warren's re-entry into the top six was one of the great stories of the night. His 9th-place finish last year had many fans wondering how much he had left in the tank. He answered conclusively tonight: plenty. His incredible conditioning was reminiscent of the Branch Warren of old, and he was as big as ever.